Mick Stoltenberg has a clear-cut top memory when it comes to the Nebraska-Colorado rivalry. The year is 2008, Colorado is in Lincoln down two with a minute left near midfield. A win gets the Buffs bowl eligible. Then Ndamukong Suh happened. A Cody Hawkins pass gets knocked into the air at the line of scrimmage, Suh picks it off and returns it 30 yards for a touchdown. Colorado misses out on postseason festivities. That’s No. 1 in Stoltenberg’s mind. He has others. When asked Monday morning at the team’s weekly press conference, the senior defensive tackle listed Alex Henery’s game-winning 57-yard field goal, too. Everyone that knows Nebraska knows Nebraska-Colorado. Frost doesn’t feel like he needs to bring the past up to get his guys ready for the present, though. Not with everything going on. The Huskers just had the Frost era delayed one Tunnel Walk and one kickoff into it. They’re ready to play regardless of who is on the other sideline. And Nebraska was ready to go on Monday. Aside from the fact the team didn’t have tape of a previous game to watch, Sunday was mostly the same for the Huskers as they turn the page from a disappointing Saturday to a new week and prep for Colorado. There were still recruits on visits, so coaches met with them. There was still tape of Colorado, so coaches watched that and built a gameplan. “The challenge is you don’t get the benefit of your first game going into your second one,” Frost said. “Most coaches will say you improve the most between game one and game two. We don’t get the benefit of that so we’re going to have to make up for it in practice. The Huskers haven’t watched a ton of film on Colorado but they will in the coming days. Still, most of the guys that met with the media were aware of what the Buffs did in their season-opener. On Friday, Colorado rolled over in-state rival Colorado State 45-13. From the final 5:54 of the first quarter through the end of the game, Colorado outscored the Rams 31-6. Quarterback Steven Montez had more touchdowns (four) than incompletions (three) and topped 300 yards. The Buffs had a 100-yard rusher and a 200-yard receiver. In most instances, you’d think that kind of demolition would make the team’s next opponent stop and take notice. Foster said it just makes the Huskers more anxious to get on the field with them. The difference between CU and Akron is Colorado doesn’t just bring offensive similarities to the table, it looks a little like the Huskers on defense too. Frost said it, Martinez said it. The odd-man fronts the Huskers will see Saturday won’t be new; they’ve seen them from defensive coordinator Erik Chinander for months. 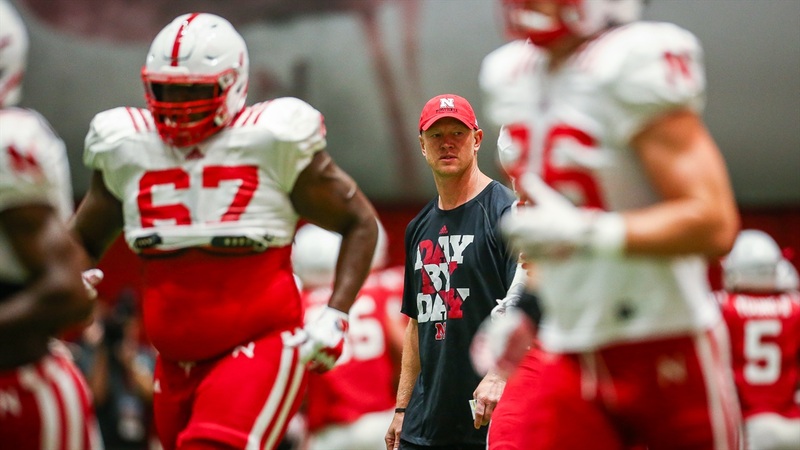 “That’s going to help as we’re trying to get everything installed and have guys understanding blocking schemes and the Xs and Os of everything,” Frost said. Maybe there’s an extra layer added to this whole thing with the new season-opener being a Power Five opponent. Foster was asked if that presents any unique challenges; he said a little yes and a little no.